The Culver Dart was a 1930s American two-seat light monoplane aircraft produced by the Dart Aircraft Company (later the Culver Aircraft Company). In the early 1930s Al Mooney was working for the Lambert Aircraft Corporation, builders of the Monocoupe series aircraft. He designed a small two-seat monoplane, the Monosport G. When the company ran into financial difficulties Mooney bought the rights to his design and with K.K. Culver formed the Dart Aircraft Company. The aircraft was renamed the Dart Dart or Dart Model G.
The aircraft was a low-wing monoplane designed to be light with clean lines to enable it to use low powered aero-engines. 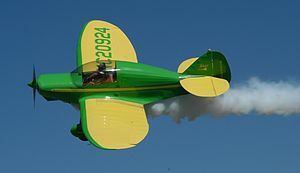 It had a fixed undercarriage and a tailwheel. The initial version was named the Dart G powered by a 90 hp (67 kW) Lambert R-266 radial engine. That engine was in short supply, so the aircraft was fitted with a Ken-Royce engine and designated the Dart GK. The final version was the Dart GW powered by a Warner Scarab Junior radial engine. Two special aircraft were built with larger engines. In 1939 the company was renamed the Culver Aircraft Company and the aircraft was renamed the Culver Dart. Initial production version powered by a 90 hp (67 kW) Lambert R-266 - ca. 50 built. Variant fitted with a 90-hp (67 kW) Ken-Royce engine - 25 built. Final production version powered by a 90 hp (67 kW) Warner Scarab Junior - 8 built. Two aircraft fitted with larger Warner engines, one with a 125hp (93 kW) engine, and the other with 145hp (108 kW) engine. An experimental variant modified with a 220-hp Continental R-670, 8 foot wing reduction and a 188 mph cruise speed. Used by Rodney Jocelyn in national aerobatics. Simpson, R.W. (1991). Airlife's General Aviation. Shrewsbury, England: Airlife. ISBN 1 85310 194 X.